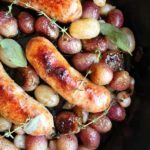 Roasted Sausage and Grapes are the perfect combinations of sweet and savory. Made with sweet Italian sausage, grapes, and pearl onions. Boil a large pot of water and cook sausages for 15 minutes. Remove from pot and set aside. In a large stove-top oven-proof skillet (I use cast iron) add the butter and oil. Add the grapes, onions, herbs, and thyme. Cook for 1-2 minutes, just to coat grapes and onions with the butter oil mixture. Nestle sausages in between the grapes. Place the skillet in the hot oven for 15-20 minutes. Flip sausages over and cook for another 15-2minuteses. Remove skillet from the oven. Place the skillet on the stove-top, add the balsamic vinegar. Add the sausage back to the skillet and cook for another 3-4 minutes.